The Mojito is one of the world’s most popular classic cocktail, and a favourite of both Ernest Hemingway, who spent many days in La Bodeguita del Medio sipping mojitos during his time in Cuba, and mine, and this is the drink I order (majority of the time), whenever I want to relax and unwind. So where in London can you be guaranteed to have a delicious Cuban Mojito? With uber stylish, Contemporary decor, and ultra comfortable seating, The Perception Bar is a lovely chic bar to enjoy really good cocktails in a vibrant and trendy venue. With classy and unique decor, this spacious bar, spread over 2 floors, is a really nice venue for a catch up with colleagues, friends and to have some decent and delicious cocktails. Located in Kings Cross, a few minutes walk from the underground station, it has a really nice atmosphere and vibe. Voted the world’s best bar for 4 consecutive years, it is easy to see why with cocktails made with quirky but classy drama and one of the best Mojitos I have had in London. I love the relaxed vibe despite being located in a 5 star hotel, with neighbouring restaurants such as Roux at the Landau. I love this bar and it is always the one I think of going to whenever I am near Oxford Street. 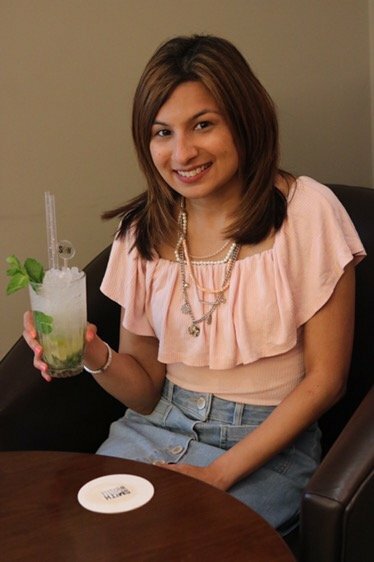 With a luxurious upmarket feel, beautiful colours, and ultra stylish decor, The Connaught Bar in Mayfair, at the 5 star hotel, The Connaught, did have the best Mojito I have had in London. Not surprising as it has won many accolades, such as World’s Best Cocktail Bar. Your Mayfair Local. Well at least mine if I am around Green Park! I love this bar, with its theme of detectives, mystery and missions, and it is such a lovely relaxed space, with amazing service. There is also an outside seating area if the weather plays ball! Located at the Sheraton Grand Park Lane Hotel, it is a fantastic bar for fun catch ups with friends, family or work mates. The mojito is pretty spectacular too! If you have had a really good Mojito in London I would love to know where (in the name of research) so let me know in the comments below! The Connuaght is one of my favourite bar in London too!